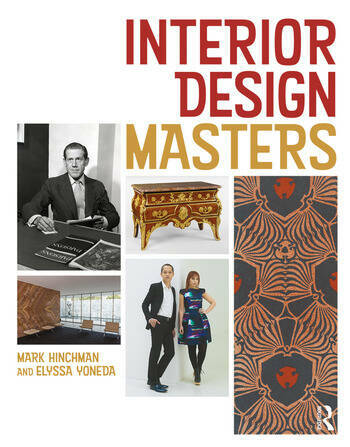 Interior Design Masters contains 300 biographical entries of people who have significantly impacted design. They are the people, historical and contemporary, that students and practitioners should know. Coverage starts in the late Renaissance, with a focus on the twentieth and twenty-first centuries. The book has five sections, with the entries alphabetical in each, so it can serve as a history textbook and a reference guide. The seventeeth- and eighteenth-century section covers figures from Thomas Chippendale to Horace Walpole. The nineteenth-century section includes William Morris and Candace Wheeler. The early twentieth-century section presents modernism’s design heroes, including Marcel Breuer, Eileen Gray, and Gilbert Rohde. The post-World War II designers range from Madeleine Castaing to Raymond Loewy. The final contemporary section includes Ron Arad and the Bouroullec brothers. These are the canonical figures who belong to any design history. The book also contains less well-known figures who deserve attention, such as Betty Joel, the British art deco furniture designer; Paul Veysseyre, the Frenchman active in China in the 1930s; and more recently Lanzavecchia-Wai, the Italian-Singaporean duo whose work ranges from health care to helicopters. Global in its coverage, the book is richly illustrated with over 600 black-and-white and color photographs. Mark Hinchman is a professor of interior design at the University of Nebraska, USA, and has also taught at Taylor’s University, Malaysia. He worked in corporate interiors in Chicago and Frankfurt before earning his PhD at the University of Chicago, USA. He has written a number of books and articles about design history. Elyssa Yoneda is an interior designer at IA Interior Architects in San Francisco, CA. She previously worked for The Beck Group, Dallas, TX, where her projects ranged from health care to corporate and education. She graduated with a Bachelor of Science in Design – Interior Design from the University of Nebraska, USA, in 2012.